Using case studies from extensive research in Denmark, landscape architect and urban designer Mike Harris demonstrates how Copenhagen transformed itself from a city of traffic jams to a city of people. In this design ideas manual he draws on Danish design principles to demonstrate how a range of Australian street types can be reconfigured for safe, comfortable and stress-free cycling. Reconfiguring Sydney Streets presents a sample range of typical profiles of streets in Copenhagen and Sydney. With photos and technical illustrations, Harris demonstrates how each of the selected Sydney streets could be reconfigured with minimal disruption and cost so that much safer and enjoyable operating space can be provided for people of all ages. The amenity of the neighbourhood is further improved through street plantings, ease of access and the reduction in motor vehicle speeds. 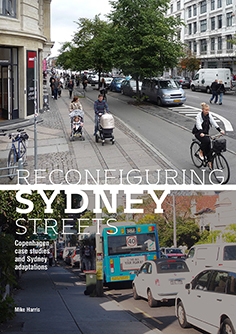 Reconfiguring Sydney Streets is now available as a free PDF download. Click on book cover (right) to download the 46 page A4 manual.